With simplicity as its keynote, our new SL3 thermostatic shower is clinical in appearance and easy to clean and maintain. With simplicity as its keynote, our new SL3 thermostatic shower is clinical in appearance and easy to clean and maintain. The slender lever of is easy to grip and control and with its clean, simple lines it offers the perfect minimal look in any modern bathroom. 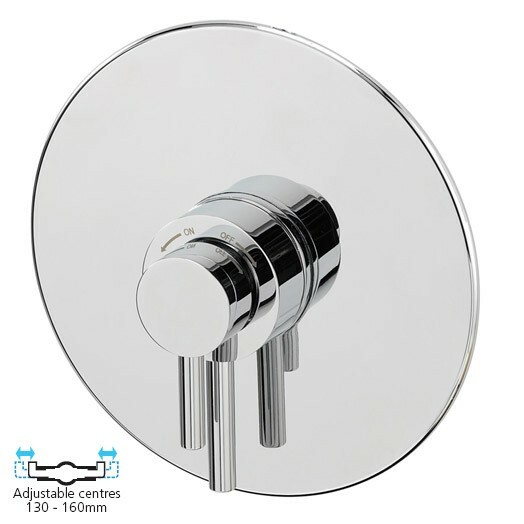 This shower valve is manufactured in chrome plated brass complete with metal handles. The inlet pipe centres on this SL3 concealed shower are adjustable from 130mm to 160mm. This SL3 shower valve is suitable for both high and low pressure water systems and requires a minimum operating pressure of 0.2 bar. This shower is ideal for use with our wide selection of fixed shower heads and shower kits, also seen in our showers section. Please remember if you are using this shower with a shower kit you will also need to buy a wall outlet elbow. To add the finishing touch to your room, we recommend the matching range of SL3 basin and bath taps. This replacement valve is better engineered than previous valve which failed after only 10 months use.